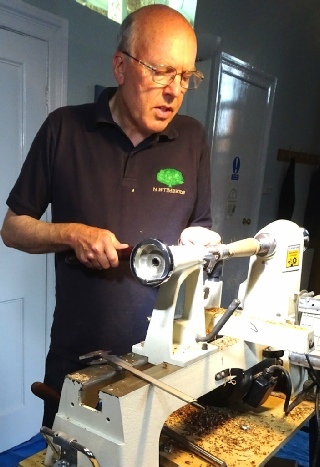 Roger Foden showed us that a disability in no way stops an expert turner making superb pieces. 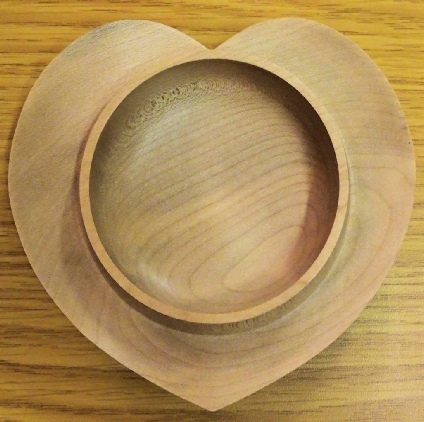 He made a very special heart shaped bowl. He explained his techniques in detail and finished with a superb item. I think we all admired how he was able to cope so very well. Thank you very much Roger. 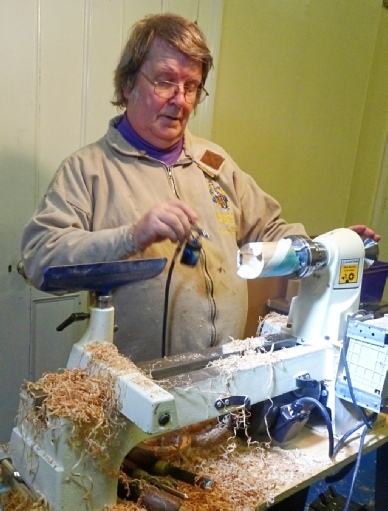 One of our members Neil Cowen was brave enough to give his first ever demonstration to us this evening. I still remember my first demonstration many years ago and it is a very worrying experience. 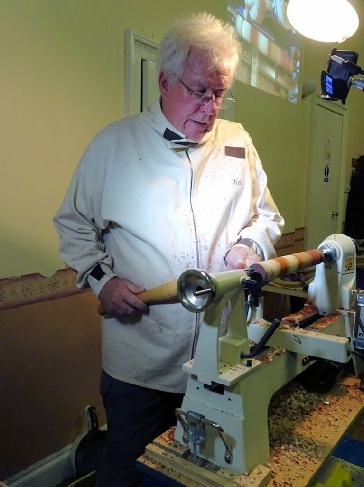 However Neil spent the evening showing us how he makes rolling pins. 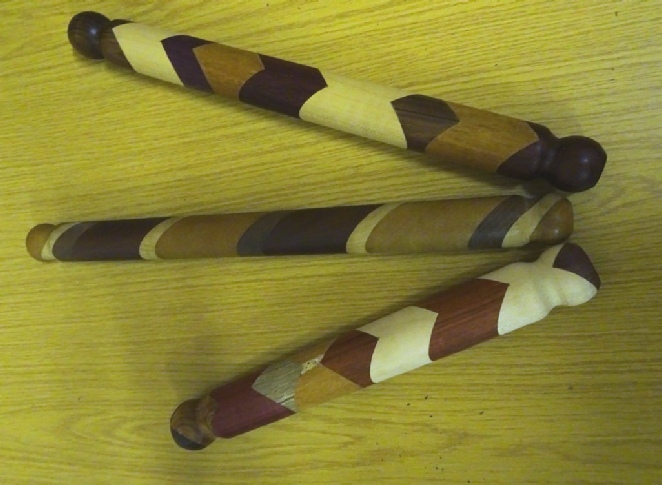 This may seem to be a very simple task but Neil added his special way by cutting different wood into special shapes and then bonding them together to make a very attractive rolling pin. 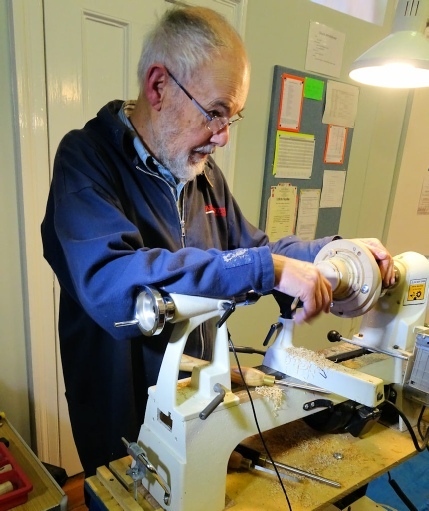 He found that woodturners can be very forgiving if things go just a little bit wrong. Well done Neil. 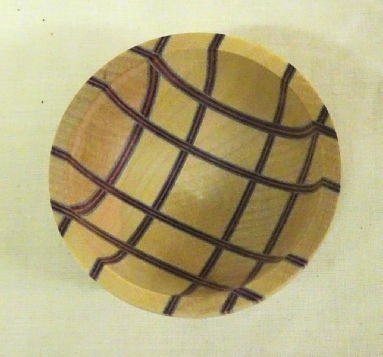 Carlyn Lindsey showed us some of the techniques used to produce her laminated work. 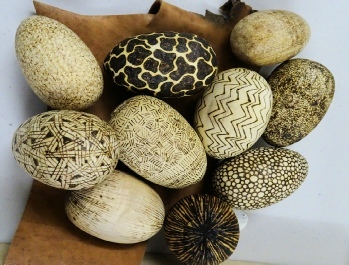 She pointed out how precise the preparation of the individual pieces must be to achieve the exactness of her designs when assembled. Her attention to detail made us all think twice about the way we work on our own pieces. Thank you Lyndsey. 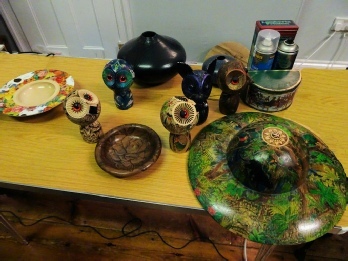 Tony Walton spend an evening showing hollowing techniques and various decoration ideas. 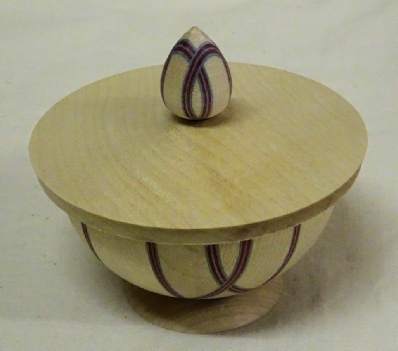 He made a very small hollow form which enabled him to demonstrate the use of various tools without boring us with too much time out of sight inside. 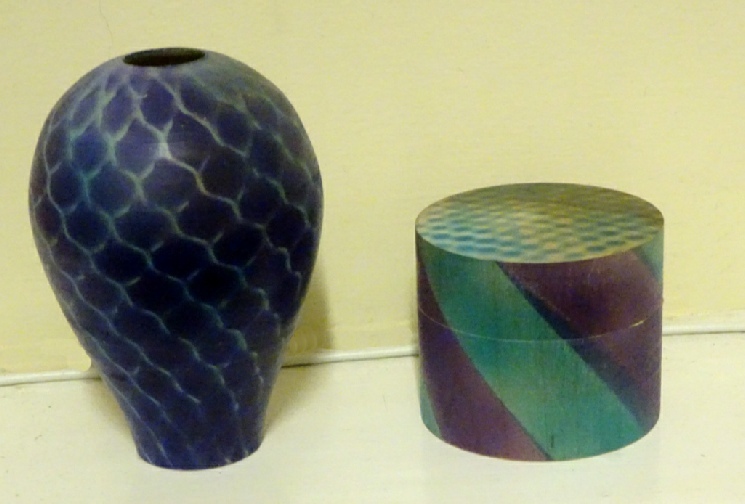 He then decorated the outside and did further decoration on the outside of a small lidded box. Thank you Tony. Once again we welcomed Andy Coates to our club. 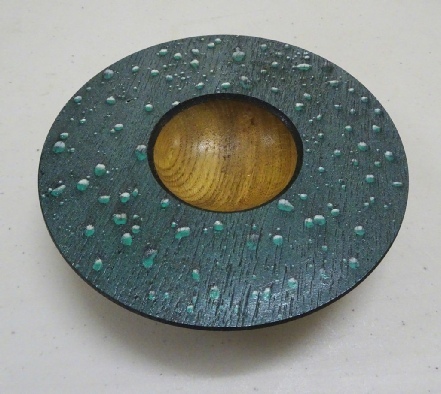 Andy started by showing the process of making the most lifelike raindrops on a flat piece of wood. He was not able to take it to completion as it takes a long while to develop. 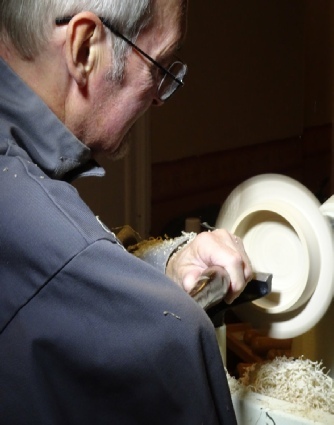 He then gave us lots of hints and tips about turning a platter. 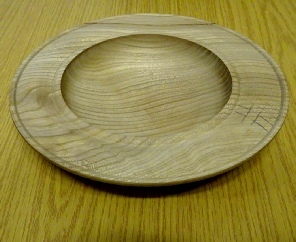 He then finished with a small natural edge conical hollow form. 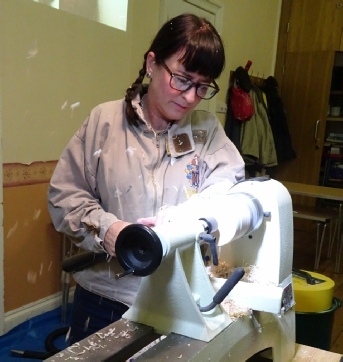 Andy presents his activities so clearly and precisely that we all learned many different cuts which I am sure will inspire members to try out. 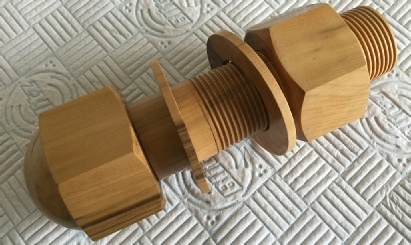 Paul Howard yet again impressed us with his project using two special jigs. He promised that he would make a nut and bolt box, yes a box to put things in. 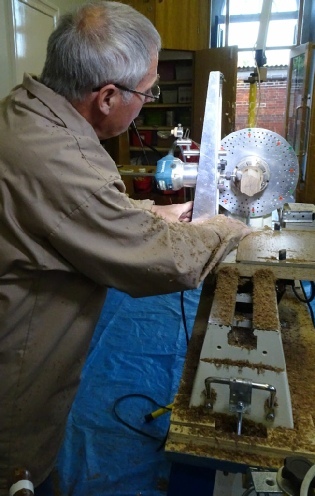 He showed us how easy it is to make a threaded lid provided that great care is taken to set the jig up. 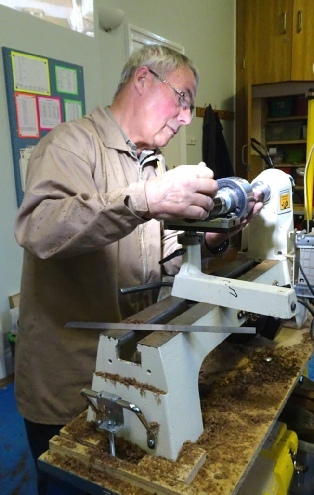 He then showed us how to make a square headed nut and bolt using his router jig. The result was really impressive. Thank you Paul. 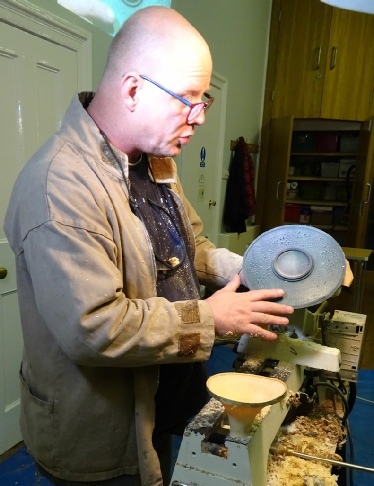 It was great to see Bob Riches back demonstrating for us he gave us a very interesting evening He showed some of his favourite tools and how he uses them and gave us some very good ideas on how to do a set of beads on two pieces of work. 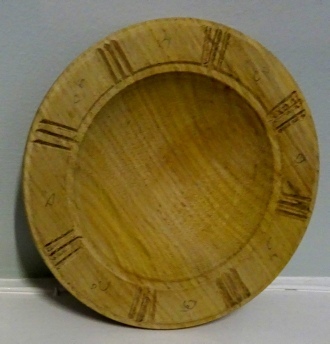 He also showed us a plate which he had made with a decorated rim and he had decided that it was not really OK. How nice it is to see things that have been tried and don’t quite work, I am sure that all of us have tried things and ended up chucking them in the bin. It happens to even the most experienced turners, how do we learn if we don’t try? Thank you Bob. 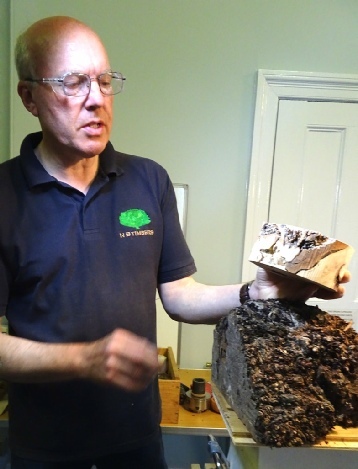 Peter Nicholls gave us a very interesting evening showing us how to best deal with lumps of wood both green and seasoned. 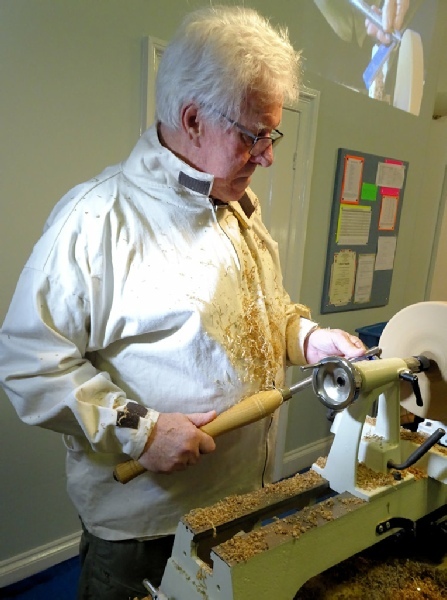 He said that when we get a new piece of wood it is best to decide the sort of thing that it may be used for ie bowls, plates or spindles and do the initial processing as soon as possible. 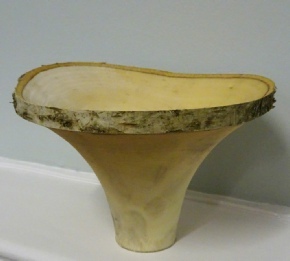 Typically if it is a log which would make a good bowl then it is a good idea to at least roughly halve it and if green to seal the ends. He showed us a cross section of a log and showed the different cuts which might be useful. He also showed how to deal with Burrs. 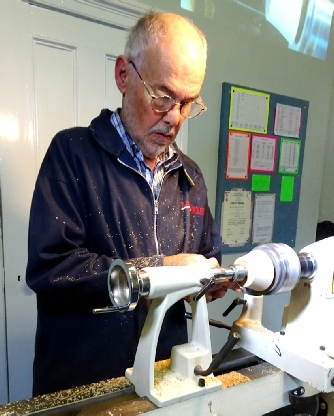 He made a baton and showed how to make a beaded handle. 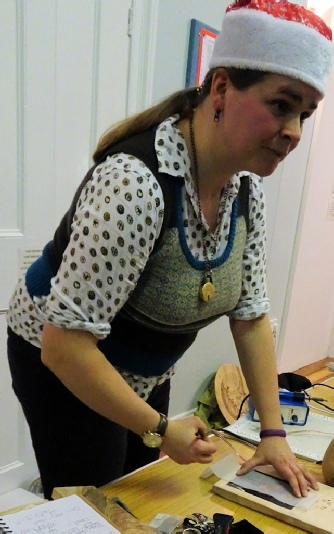 Tick Challiss gave us a fascinating demonstration of her Pyrography and decoration techniques. Her presentation of how she did her work contained a lot of detail without taking to much time. This enabled her to show much more than we had anticipated. I am sure that she will have encouraged more of us to have a go. Very well done Tick. 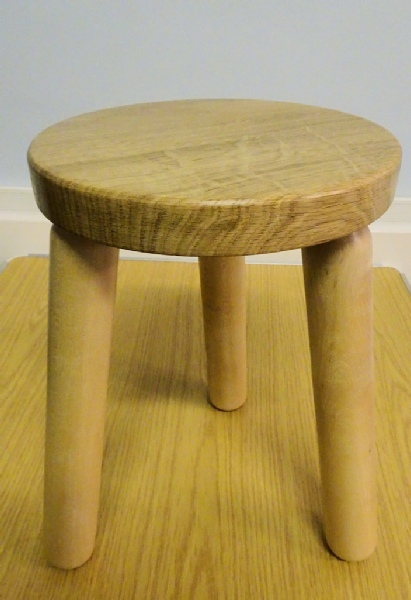 Neil Cowen Started this year by showing us how he made a small three legged stool. He first showed how he made the top with holes on the underside set at 120 degrees and a slight angle. He then went on to show us the making if one leg and challenged anyone carry on to make the second leg. As expected no one would take on the challenge. For one who had done only a couple of demonstrations before he did well. Thank you Neil. 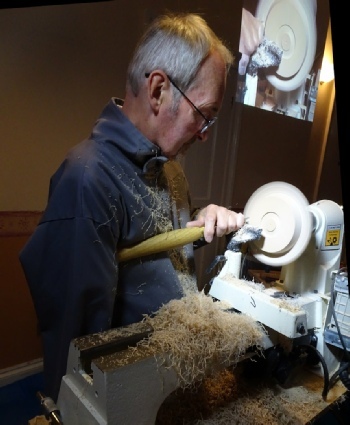 Bob Riches gave us an interesting evening showing us a number of techniques using two wooden off centre jigs. 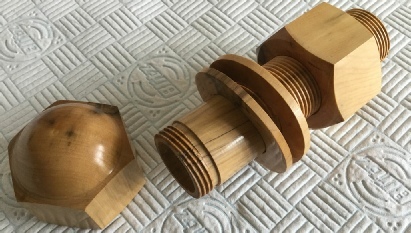 These were the sort of jigs which most of us could make ourselves. 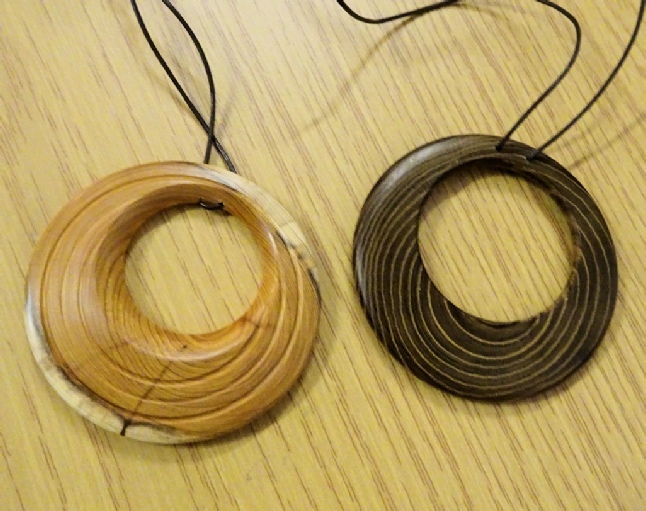 He made a ladies off centre pendant complete with a hanger which could be attached in two ways.